Summary (Goodreads): TWO MISFITS. ONE EXTRAORDINARY LOVE. It’s 1986 and two star-crossed teens are smart enough to know that first love almost never lasts, but brave and desperate enough to try. 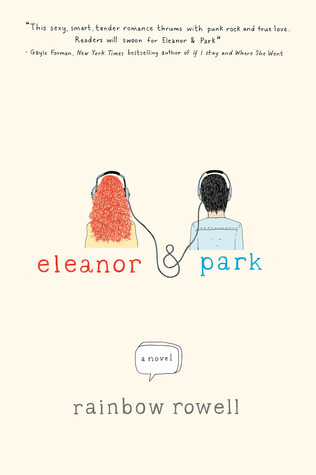 When Eleanor meets Park, you’ll remember your own first love–and just how hard it pulled you under. A cross between the iconic ’80s movie Sixteen Candles and the classic coming-of-age novel Looking for Alaska, Eleanor & Park is a brilliantly written young adult novel. Review: I’ve put off reviewing this book not because I didn’t like but because I didn’t (still don’t) know how to put my review into words. Every ime I sat down to write about this book, I couldn’t think of any words that would do it justice. But the one word that kept coming to mind was BRILLANT. I have to admit that I have a soft spot for all things 80s. It could be because I grew up during that time or could be because of all the amazing movies that were produced during that decade (who doesn’t love Top Gun, Breakfast Club, Sixteen Candles?) However, I love this book for much more than it’s setting (however, I do find it to be a blow to the ego when it is categorized on some people’s shelves as “historical fiction”–ouch). Eleanor and Park jumped off the page and into my heart with their awkwardness and heartbreaking stories. This was one of those books that I couldn’t put down but that I never wanted to end. I know I still haven’t done this book justice, so you’re just going to have to read it for yourself to discover just how wonderful it really is.